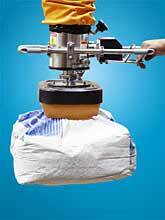 Versatile vacuum lifting pads for virtually all industrial bag and sack lifting applications. Designed for robotic end effectors, tube lift systems, and pick and place machines. High quality rubber seals are long lasting and will lift even crumpled bags with ease. ANVER Bag Head Vacuum Pad Attachments are ideal for use with vacuum tube lifter systems in the food, chemical, and pharmaceutical industries, or anywhere bags are used. The three standard sizes available will handle all the standard bag sizes found in industry today. Stainless Steel Bag Heads: These highly polished vacuum attachment pads feature a stainless steel top cover, stainless or plastic mesh screen, and hand-replaceable foam sealing rings. These are rugged, heavy duty pads for continuous industrial use. A four mounting hole pattern allows the pad to interface with various standard ANVER adapters, swivels, etc., and other machine mounts. Plastic Bag Heads: ANVER also builds a line of rugged, plastic bag lifting heads, which can handle most commonly used bags. They are durable, lightweight, dent-resistant and very economical. These plastic bag heads are top sellers in this market segment and well-suited for the majority of applications. Note: Special Order Skirts – BH40/52/73-SK is available for BH40 & BH73 Series and BH90-SK is available for BH90 Series. Note: Please consult with factory for adapters, extensions, etc. Most feature two inch diameter connectors to accommodate the high airflow required for bag lifting and handling. Special foam seals are available with Extra Soft Edges, for handling printing signature bundles.